The world today refers to Salzburg′s most famous son as "Wolfgang Amadeus Mozart". In fact, his name was officially "Johannes Chrysostomus Wolfgang Theophilus Mozart" with "Amadeus" being a Latinised variation of "Theophilus". Mozart himself signed in his later years as "Wolfgang Amade", and referred to himself as "Amadeus" only when he was joking. His family and friends called him simply "Wolfgang" or in the abbreviated way "Wolferl". The romantic German poet Hoffmann called himself in honour of Mozart "Ernst Theodor Amadeus Hoffmann" and earned quite a bit of fame in literature himself. Based on Hoffmann′s propagation of this name, music companies and radio station in the 20th century eventually agreed on the convention of called Mozart "Wolfgang Amadeus". In the 1980ies, the Austrian pop-star Falco had his greatest hit with the song "Amadeus", dealing with Mozart′s life as a superstar. The Salzburg gnome or dwarf garden is part of the Mirabell gardens in the heart of the city. It contains statues of gnomes or dwarfs, little people with grotesque faces that look more like caricatures. In fact, some of the models for the gnomes were real people, living at the court of the Prince Archbishop. With Baroque times not being very much into political correctness, the Salzburg gnomes are often arranged in archetypical dresses of peasants or nationalities. Watch out for a Turkish gnome! The Zwergerlgarten or dwarf garden was built under the reign of Prince Archbishop Franz Anton Harrach in 1715. Today, the gnome garden is incomplete - some of the Salzburg gnomes have disappeared over the course of the centuries, others are kept in locations known. Nevertheless, the garden itself is definitely one of the highlights of Salzburg and a great photo-opportunity. In the historic cemetery of St. Peter you will find a grave with seven crosses. According to a legend, this is the tomb of a murderer and his six victims. The court-mason and bricklayer Sebastian Stumpfegger is said to be the murderer of his seven wives. All of Salzburg was puzzled, when one wife after the other died and Stumpfegger got married again and again; but nobody ever found the faintest hint for an unnatural death. After he got married to his seventh′s wife, the mystery was solved: the woman could escape the murderer and reported how he managed to kill his victims without leaving any traces of a crime. He had bandaged his wives with tape, leaving only the feet exposed. Then, he tickled them until they died. Stumpfegger was involved with the building of the Kollegienkirche in Salzburg and the Trinity pillar ("Dreifaltigkeitssäule") in Linz. He was a wealthy man and had 21 children with his seven wives. However, if anything about the legend with the murder is true in any sense is unknown today. The so-called Zauberflötenhäuschen is placed in the gardens of the Mozarteum Foundation in Schwarzstraße 26, more precisely in the "Bastionsgarten". Mozart wrote at least parts of the Zauberflöte, "The Magic Flute" in this little hut. Originally, it was situated in a Garden next to the "Freihaustheater" or "Theater auf der Wieden" theatre in Vienna. The story goes, that libretto-author Emanuel Schikaneder locked Mozart into the Zauberflötenhäuschen to ensure that they would meet their deadlines. Other stories talk about Mozart meeting singers in the Zauberflötenhäuschen to practise parts of the opera. After the original gardens in Vienna were sold, the duke Fürst Starhemberg donated the Zauberflötenhäuschen to the International Mozart Foundation in 1873. It was moved to Salzburg and re-erected in the Salzburg gnome garden by Mirabell castle. From there it was moved to the Kapuzinerberg mountain in 1877, where it remained until it was damaged by bombs in WWII. After the war, the Zauberflötenhäuschen was renovated and moved once again, this time to its current location in the Schwarzstraße. In July and August it can be visited with a guided tour through the Mozarteum art university. In the end, the enemy thought that the people of Salzburg were slaughtering a bull every day, expecting that the live stocks were still large enough to feed the troops and people in the city for a very long time. Eventually, the troops that kept Salzburg under siege withdrew, leaving Salzburg to freedom. Under cheer and laughter, the bull was led to the Salzach river and washed until he appeared again in his natural brown. Ever since then, people from Salzburg are called "Stierwascher" - bull washers. In fact, bull-shitters would be more appropriate with respect to this story. The hole legend is nothing but fiction, the real reason for the name "Stierwascher" are the butchers of Salzburg that were committed to slaughter bulls in public spaces to allow the authorities to control the quality of the meat. The slaughtering was done by the shore of the Salzach River to allow the blood being washed off quick and easily. This is the less romantic, but apparently more authentic root of the "Stierwascher". There is a letter by Mozart from 1774, that he wrote to his sister Nannerl when he was 18 years old and which reads as follows: "…an die Jungfrau Mizerl bitte alles erdenkliches, sie soll an meiner liebe nicht zweifeln, sie ist mir beständig in ihrer reizenden negligee vor augen; ich hab viele hübsche Mädl hier gesehen, aber eine solche schönheit habe ich nicht gefunden". That means something like "…to the virgin/Miss Mizerl my kindest regards, she shall not doubt my love, she in her lovely negligee is in my mind all the time; I have seen many pretty girls here, but I found no such beauty as her…"
This letter sparked the wildest speculations about the young Mozart being in love with a local girl from Salzburg, and a lot of scholarly dispute was fought over the identity of this woman that Mozart described with the most tender terms. However, as we know today, Mizerl was Maria Anna Raab, the landlady of the Mozarts and owner of the Tanzmeisterhaus. She was 46 years older than Mozart and the letter was obviously meant to be a joke. 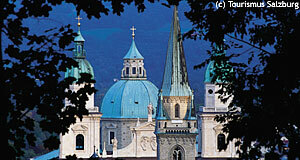 Wolf Dietrich von Raitenau was the first Prince Archbishop of Salzburg who shaped the city during its Baroque prime. When his nemesis and successor Markus Sittikus forced him out of his office and even arrested Wolf Dietrich in the Hohensalzburg Fortress, did Sittikus best to make the people of Salzburg forget about von Raitenau. Although somewhat speculative, it can be estimated that this is the reason why Wolf Dietrich von Raitenau is buried at St. Sebastian Cemetery. As a Prince Archbishop, he should have been buried in the crypt of the Salzburg Dom Cathedral. He ended up outside the town centre without much honour. Legend has it, that Wolf Dietrich was buried upright, sitting in a chair surrounded by blueprints and sketches to plan the construction of even more buildings in his beloved Salzburg. It is said that he will sit like that until Doomsday, when he will stand up and ask the Lord for mercy for himself and his enemies.